As a teacher and a Liberal Christian I really struggle with a religion that does not allow children to celebrate holidays. In my previous post I talked about how special Christmas traditions are to me. Most teachers give out treats to children on their birthday but teachers have been told not to give children of Jehovah’s Witnesses treats on their birthday. Some children of JW’s tell teachers that they cannot accept cupcakes when passed out for a classmate’s birthday. 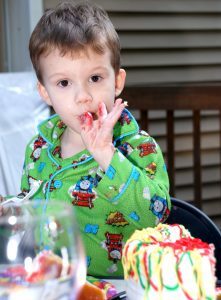 But in my experience most kids just sit quietly through the birthday song and then eat the cupcake anyway. Jehovah’s Witnesses present other problems for teachers and schools. They don’t pledge allegiance or sing the National Anthem. They don’t do papers or activities related to holidays. The very phrase “Jehovah’s Witness” inspires resentment in the hearts of many teachers. I looked at the web page https://www.jw.org/en/jehovahs-witnesses/faq/birthdays/ to have a basic understanding of this custom. They make a good Biblical case. But I still don’t believe it. JW’s, like other religions, insist on going straight back to the Bible for decision making. The argument against Birthdays doesn’t acknowledge the evolution of culture or the developmental appropriateness of these anti-culture requirements. They do talk about prayer and reflection, using the individual’s conscience for making decisions when put in situations where their beliefs put them in conflict with culture. Some would argue that these counter-culture experiences strengthen the faith of the children. I think the kids mostly just feel guilty, conflicted and embarrassed. Having JW’s in my class does force me to carefully consider whether or not it is appropriate to incorporate certain symbols into my classroom. I tossed my scary-looking jack-o-lanterns and I don’t give kids worksheets with ghosts or basket-toting Easter bunnies on them. No big deal. But it is fun to decorate pumpkins, trees and eggs. I don’t care that 2,000 years ago some Pagans had their own reasons for this. I decorate them because they are common, everyday objects in my world. Decorating the common place makes me happy. Decorating with my kids is really special. I want to share that happiness with my students and it really angers me when someone says I can’t share that joy with my students because I will be putting their kid in a bad position. It would be easier on the JW kids if they weren’t the minority, but I have never had more than 2 in a classroom at a time. I have opinions on teaching patriotism and voting and pledging the allegiance too, but for now I will just leave you with this thought: How can anyone participate in a religion that makes their kids feel guilty about joining in the fun of all the kids around them? 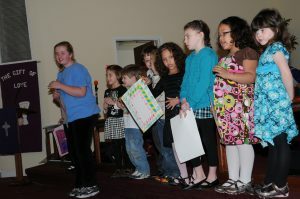 Children with Birthday cards in church.